Anytime I can cook for a big crowd, I jump at the chance. Paleo-style appetizers, in particular, are a real crowd pleaser that many people can enjoy before the main course. My diet is largely Paleo-inspired, so I love to try various recipes that reflect that lifestyle. The Paleo diet avoids grains, dairy, beans and legumes, processed foods, and certain vegetables like corn. Instead, it is a great opportunity to utilize grass-fed, organic, pasture-raised, antibiotic-free, hormone-free, and chemical-free animal products, such as eggs, fish, poultry, and lean meats like beef and duck. The diet also includes lots of vegetables, moderate fruit consumption, nuts and seeds, and healthy fats like avocado, coconut oil, and olive oil. For many, the Paleo lifestyle is simple and will include lots of vegetables and some meat. Others, like me, will explore different recipes to come up with something that takes a little more time to prepare. The following are five of my favorite Paleo appetizer recipes that you can enjoy before or part of your main course. If you are planning a get-together, it is a great idea to make each Paleo appetizer recipe as finger foods for the party. The following appetizer is by far my favorite recipe ever. It takes classic restaurant food and gives it a healthy kick with a turmeric glaze. Turmeric contains the phytonutrient called curcumin, which is an anti-inflammatory compound that promotes optimal liver health. Chicken wings can be eaten as a side or part of a main course. Some people may think that chicken wings are not healthy, but you should be okay if you know the source. I get my chicken wings from a local farmer. The unique taste of this turmeric marinade will have you making this recipe for your friends every chance you get. You can also use the turmeric marinade for whole chickens, drumsticks, or thighs. It makes the perfect marinade for any poultry. The following chicken wing recipe will make about 18 chicken wings, and will feed about three or four people as an appetizer. Put all the marinade ingredients into a food processor or high-speed blender, and blend until everything is finely chopped and blended. It will be thicker than a dressing with a good consistency for rubbing onto the chicken wings. Pour the marinade over the chicken and reserve a little extra for later. Turn the wings over so that both sides get covered. Let them marinate in the refrigerator for at least an hour, or overnight. Preheat the oven to 425°F and place the wings skin-side down on a raised edge baking pan, and make sure they do not touch. Two pans will likely be needed. Bake for 30 minutes, and flip. Once all the wings are skin side up, apply the reserved marinade, and bake for another 10 to 15 minutes, or until they are crispy and done. Garnish with extra chopped cilantro and enjoy. Deviled eggs are a perfect snack, and adding avocado to the mix is an excellent way to add more healthy fat to this protein-based egg appetizer. Organic eggs are an excellent source of nutrients like tryptophan, selenium, iodine, vitamin B2, vitamin B5, vitamin B12, and vitamin D.
The following recipe makes 12 deviled eggs that your guests will surely enjoy before the main source. Cut the eggs in half, and remove the yolks. In a medium bowl, mash the yolks, and avocados. Stir in the cilantro, chives, lime juice, salt, oregano, rosemary, cayenne pepper, and red pepper flakes. Scoop the filling into the egg whites with one tablespoon of the avocado-egg yolk mixture. Refrigerate until serving time and sprinkle with chili powder. 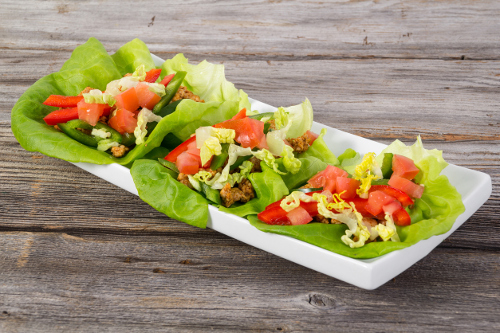 Lettuce wraps are a great way to get rid of whatever vegetables or proteins you have in your refrigerator. Chicken is the star of this appetizer. Organic, grass-fed chicken is a great protein source, along with tryptophan, vitamin B3, vitamin B6, and selenium. The chicken is sautéed to create buffalo chicken with garlic, onion, and chipotle powders. The following appetizer recipe will make up to four small buffalo chicken lettuce wraps. Slice the chicken thighs into quarter-inch strips. Toss the chicken in a mixing bowl with chipotle powder, onion powder, dried oregano, chipotle powder, sea salt, and black pepper. In a skillet over medium heat, melt the coconut oil. Place the chicken thighs in the skillet. Cook them for about five to 10 minutes. Occasionally turn until the chicken is white all the way through. Serve in lettuce cups, and top with sliced avocado, cherry tomatoes, and green onions. Fish is another great omega-3-rich food to add to a lettuce wrap. The romaine lettuce, cucumber, and cherry tomatoes give this appetizer recipe a nice dose of vegetables, while the avocado sauce provides more healthy fat to this refreshing recipe. The following recipe will make four servings and is a perfect appetizer for four guests. Double the recipe if you have more people to serve. Preheat the oven to 350°F. In a shallow baking dish, arrange fish skin side down. Stir together the lime juice and olive oil. Pour the mixture over the fish and season with pepper, sea salt, and cayenne pepper. Bake for 20 to 25 minutes, until the fish is fully cooked and flaky. To assemble, place the flaked fish on the romaine leaves and top with cucumber, cherry tomatoes. For the avocado sauce, combine all the sauce ingredients in a small food processor. Top the tacos with the avocado sauce. Finish with a squirt of lime juice. Sea vegetables like nori are a great addition to any diet, including Paleo. Nori is that seaweed famous known for its role as the wrapper used for making sushi rolls. It also makes for the perfect handle-container that is great for any appetizer recipe. Sea vegetables are also an excellent source of iodine, vitamin K, folate, and magnesium. The recipe will also utilize whatever vegetables you may have in your fridge, including carrots, cucumber, and lettuce. This recipe makes eight paleo nori rolls for your guests to enjoy. Shred the carrots, julienne the cucumber and daikon radish, mince the cilantro, and thinly slice the green onion. Prepare the chicken breast in the oven at 400°F for about 40 minutes. Finely chop the chicken breast to get a half-cup of chicken. For assembling, lay a single sheet of nori out in front of you. Pour a small amount of water into a bowl, and set it next to your workspace. Arrange a few tablespoons of shredded carrot, a few julienned vegetables, green onion and cilantro, and chicken in a row along the edge of the nori sheet closest to you. Next, begin to roll the nori away from you, and continue to roll until the nori is almost rolled up. Then, use your fingers to gently rub a small amount of water on the open edge of the nori paper. Finish rolling the nori, and gently press the moistened bit to the rest of the roll. Cut it in half to reveal the tasty ingredients inside. Repeat the process until all the ingredients are used up. For the sauce, whisk together all sauce ingredients. The nori rolls can be kept in the fridge until you are ready to serve them, but be sure to eat them within a couple of days. Are you new to Paleo cooking? If so, these Paleo appetizer recipes are a perfect introduction to the lifestyle. Unless you don’t eat meat, it is nearly impossible not to enjoy the unique tastes and flavors of these appetizers. The Paleo diet is not hard to follow in general. Key takeaways from the approach are it avoids grains, dairy, beans and legumes, corn, and processed food. For your next get-together or dinner party, remember the provided Paleo appetizer recipes. They are a great start to any big meal. Just thinking about those turmeric-glazed chicken wings is making me hungry! “Smoky Turmeric Chicken Wings,” Primally Inspired; http://www.primallyinspired.com/smoky-turmeric-chicken-wings/#, last accessed May 16, 2017. Sanfilippo, D., Practical Paleo: A Customized Approach to Health and a Whole Foods Lifestyle (USA: Victory Belt Publishing Inc., 2012), 270, 322. Wells, K., The Wellness Mama Cookbook: 200 Easy-to-Prepare Recipes and Time-Saving Advice for the Busy Cook (Rockfield, Harmony Books, 2016), 228. McCarthy, J., Joyous Detox: Your Complete Plan and Cookbook to Be Vibrant Every Day (Toronto: Penguin Group, 2016), 223. “Guacamole Deviled Eggs,” Elana’s Pantry, March 17, 2015; https://elanaspantry.com/guacamole-deviled-eggs/. “Paleo Nori Rolls,” Foraged Dish; http://www.forageddish.com/blog/2015/6/2/paleo-nori-rolls, last accessed May 16, 2017. Mateljan, G., The World’s Healthiest Foods: Essential Guide for the healthiest way of eating (Seattle: George Mateljan Foundation, 2007), 310, 576, 632, 700.